Triple Crown hopeful Justify took his first tour around spacious Belmont Park on Thursday morning with a strong 1 3/8-mile gallop in preparation for Saturday's 150th running of the Grade 1, $1.5 million Belmont Stakes, presented by NYRA Bets. With Hall of Fame trainer Bob Baffert and Hall of Fame jockey Mike Smith looking on, along with a large media contingent, the Grade 1 Kentucky Derby and Grade 1 Preakness Stakes winner took to the track looking full of energy. “He just floated over this track. He was happy. He was aggressive,” said Baffert, who is seeking to become only the second trainer to win two Triple Crowns. “He went about 1 3/8 miles and jogged back the wrong way [opposite direction]. Justify, owned in partnership by China Horse Club, WinStar Farm, Head of Plains Partners and Starlight Racing, arrived at Belmont Park on Wednesday afternoon in advance of his attempt to become racing's 13th Triple Crown winner and has settled into the same barn as the Baffert-trained American Pharoah when he ended a 37-year Triple Crown drought in 2015. Justify takes on nine rivals in the 1 ½-mile Belmont, and was made the morning-line 4-5 favorite after drawing the No. 1 post. 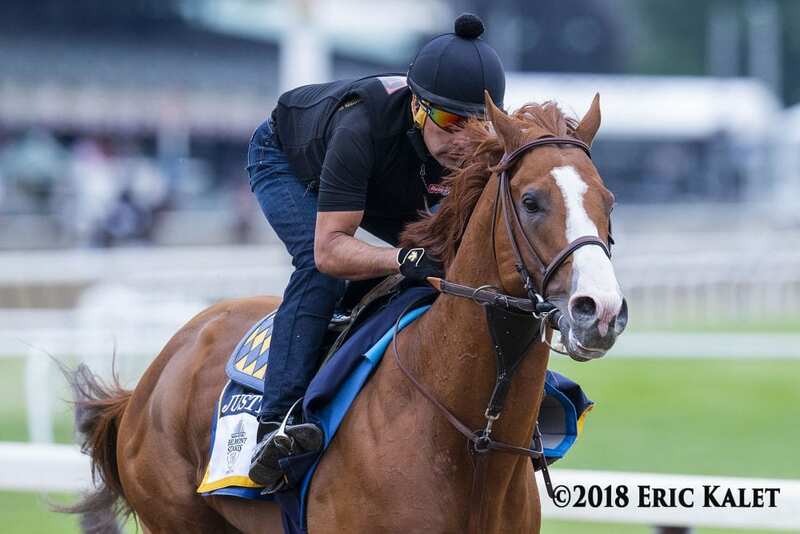 “A horse came up to him, and we usually have [his] ear plugs in, but we didn't do it today because I thought it would be really quiet today, but we'll put them back in tomorrow,” said Baffert, pointing out that Justify does not race with earplugs, and only has them in during training. “He'll probably get schooled in the one hole sitting in there a long time,” said Baffert. “Six races is a lot, but we've seen that he thrives on it,” said Baffert. “The way he's built, his muscles, you could see he's just a big, strong, powerful, horse. He's just a muscled-up strong athlete. This entry was posted in NL Article, Triple Crown and tagged 2018 belmont stakes, belmont park, Bob Baffert, Justify by NYRA Press Office. Bookmark the permalink.